Gaz mentioned some time ago about working on a new version of My Kingdom - seems it's been put together as a release for Record Store Day. The promised LP edition of the Abbey Road Cut of The Isness will also be appearing on RSD. OMG! That is VERY good news! 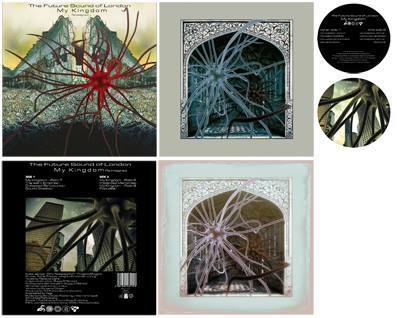 Hoping these will make it to US stores for RSD. Theory, concerning My Kindom RSD 2018: could it be the one they reworked for the Acusmatiq last year festival? I've known about this one for some time but couldn't comment. I think we need a zoomed in version of that back cover. Wow!! Can't read side A and B writings..help! Where did you get that artwork pictures? Was just about to ask the same thing - Is there a version in a larger resolution ? There’ll be a chance to get this later if you miss the RSD release, much like A:E:V last year. It sure will be strange having two long-form My Kingdom releases. Though I'm excited for any new-ish FSOL release. I wonder how much of the original long-form version will make it into this new one (if any). So excited for the re-imagined version...also very happy for the Abbey Rd cut on vinyl (even if i already have 2 copies of the original promo CD, will for sure buy it! )...and since i always dream in viral blue i really hope that after RSD day, there will be a double CD version of the Abbey cut, with 2nd CD of demos from the sessions (that were not included in The Otherness CD) or at least an extra track if single CD...that Divinity with Donovan singing....do i ask too much?.?.? OffLand wrote: It sure will be strange having two long-form My Kingdom releases. Though I'm excited for any new-ish FSOL release. I wonder how much of the original long-form version will make it into this new one (if any). It's possible that what looks like 'Part 1', 'Part 2' and 'Part 3' in the tracklist are reworkings of the three parts from the original single. Otherwise I'd imagine it'd be more like Translations than anything - what the track would sound like if the band had first made it now.